Now held by the British Library, this wee volume of psalms, containing a portrait of Henry VIII, is known as Anne Boleyn’s Gold Book. She purportedly handed this book to one of her maids of honour when she was on the scaffold, moments before her execution, in 1536. During the later Middle Ages, small volumes were fashionable among the literate elite. Prayer books, and in particular Books of Hours, were among the favoured content and often appealed to women in particular. Their smaller dimensions made them lighter and easier for the owner to carry with them throughout the day; and, worn hanging by a fine chain from a girdle – using the hoops which can be clearly seen in this example – they also made fabulous jewels and adornments. This small girdle book, containing several psalms, measures just 4cm by 3cm. The suggestion that this particular small girdle book was once owned by Henry VIII’s second Queen, Anne Boleyn and was presented by her, when she stood on the scaffold, to one of her maids of honour is delightful and intriguing but hard to substantiate. In 1873, Robert Marsham described a manuscript then in the possession of his brother, Charles Marsham, 3rd Earl of Romney, in an article (published in Archaeologia 44, 1873) entitled “On a Manuscript Book of Prayers in a Binding of Gold Enamelled, said to have been given by Queen Anne Boleyn to a lady of the Wyatt family: together with a Transcript of its Contents”. The lady in question is traditionally held to have been Lady Margaret Lee, sister of Thomas Wyatt and thought to have been one of Queen Anne Boleyn’s ladies in waiting. Marsham himself, in his Archaeologia article, acknowledges that there is no proof to substantiate the family tradition, noting that it is not mentioned by George and Richard Wyatt when they compiled the ‘family memorials’ in 1727. But Marsham does suggest that the tradition dates back to at least the mid-18th century. George Vertue, in his 1745 ‘Notes on the Fine Arts‘ says that he had seen in the possession of Mr Wyatt a “most curious little prayer-book MS on vellum, set in gold, ornaments graved gold enamelled black – such were given to Queen Anne Boleyn’s maids of honour – and was thus given to one of the Wyat family, and has been preserved for seven generations to this time”. “24 Mar 1724/5. Mr Corry brought a manuscript on vellum in a gold case enameled curiously, being forms of devotion from the Psalms etc or Consolations in distress. This belonged to Queen Anna Bollen and now in the hands of Mrs Wyat of Charter House, in which family it has been ever since her death. She also has a original picture of her”. The volume seems to have passed from the possession of the Wyatt family to that of Richard Temple-Nugent-Brydges-Chandos-Grenville (1776-1839), the first Duke of Buckingham and Chandos, of Stowe House, at some point before 1818-1819: it appears in a catalogue of the Duke’s books drawn up at that time. It was then inherited by the second Duke of Buckingham and Chandos, Richard Plantagenet Temple-Nugent-Brydges-Chandos-Grenville (1779-1861). The second Duke sold it to Bertram Ashburnham (1797-1878), 4th Earl of Ashburnham, in 1849. It was purchased by the British Museum in 1883 from the 5th Earl of Ashburnham, together with over a thousand other Stowe manuscripts. Marsham himself seems to doubt the veracity of the family tradition although he was able to confirm that the portrait mentioned in the 1725 minutes was also then in possession of his brother in the 1870s. 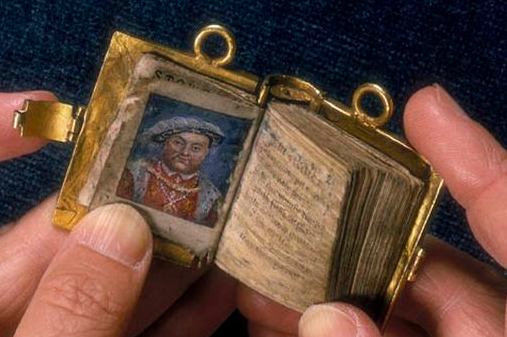 Whatever the truth behind the legend of association with Anne Boleyn, there is no doubt that this is a beautiful, historic and rare example of a Tudor miniature book. It is now held by the British Library (Stowe MS 956).